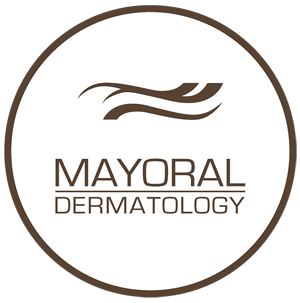 Mayoral Dermatology prides itself on providing quality, professional service in a friendly and relaxing atmosphere. We offer a gamut of cosmetic and dermatology services using cutting-edge technologies to improve and maintain skin health and appearance. Dr. Mayoral enjoys a loyal patient following due to the time she spends consulting with each patient, and her philosophy of customizing treatments based on each person’s particular need. Dr. Mayoral is fascinated by technology that requires no down time and is internationally recognized as an expert in the field of radio frequency for skin tightening. We have helped many individuals recapture a more youthful appearance – – not by changing their unique features, but by enhancing their natural beauty. We cannot turn back the clock completely, but we can certainly slow down its pace! We invite you to take a look through our Before & After Cosmetic Dermatology Photo Gallery to see before-and-after photos of some of our many contented patients. We express our gratitude to them for allowing us to share their photos with you. Dr. Mayoral is renowned in Miami and worldwide for her many studies and lectures on radio frequency devices and techniques, to restore youthful beauty. Allow her to provide you with a consultation and treatment plan. Meet the Mayoral Dermatology Team. We are group of dedicated professionals that work to always provide the best possible client experience. Botox and Dysport treat frown lines, smooth out the forehead and erase crow’s feet and are delivered with injections. Skin resurfacing for acne scars and stretch marks. Pulsed light for vein treatments and scarring. Restylane and Juvéderm are instant fillers, adding a touch of youth. Sculptra and Radiesse help re-build your body’s own collagen. Belotero works on fine lines around the mouth. Our plasma facelift uses your own platelet-rich plasma as filler. We offer patients a complete set of treatments for total rejuvenation.